Well… I didn’t want to do it. I didn’t want to buy this kit (or one of the other kits), but I figured there would be a few Mom’s who would pick up a kit and spend time baking with their kids, and those Mom’s might like a few pointers about the Rudolph Cake Pop Kit. First of all, I really didn’t like the profile design. Yes, it’s different, and that is what caught my attention; however, as I was making them, I just thought they looked stranger and stranger. The instructions to make these cake pops are straight forward and easy to do. I baked my gingerbread cake and allowed it to cool. Then I made my frosting with the packet and supplied my own butter and powered sugar. I may have rolled these a bit too thin. It was hard to judge, but they were thick enough for the stick to hold on to and not break it. I made 20 heads and then had some leftover cake pop batter. I noticed that the noses and ears broke off easily as I was pushing the cake out of the cutter. Maybe if it was thicker it wouldn’t do that?? I don’t know. But, just wanted you to be aware of it. With this kit, as well as the others that I have reviewed, there just isn’t enough candy melts included. The instructions tell you to melt your candy wafers in a tall glass. I melted mine in a large water glass and for the first 3 or 4 pops, I could dunk straight down and coat the it. However, the glass got too narrow and I could no longer dip that way. I transferred the candy to a smaller open bowl and then I had to dip one side at a time – see the photo above. Decorating the face was also difficult. The candy noses were heavy and a few fell off before the candy dried. I had a difficult time decorating his features. I placed half the vanilla frosting into the supplied piping bag and added the ears, antlers, and mouth. The frosting isn’t liquid, so the small hole I made just wan’t doing what I needed it to do. I cut it a bit larger, but the frosting on the candy just didn’t stick very well. The black icing pen was also difficult to draw with. There was no way I could outline the eyes like in the picture on the box. The lines were too thick and I think poor Rudolph looked like he had Rabies. Not good. For some of the antlers, I used chocolate Jimmies instead. I thought they looked better. So, as I was running out of candy after only 10 reindeer heads, I decided to try and save this cake pop disaster. I rolled a few heads into a round shape, searched for some pretzels for antlers and made some reindeer of my own. The only pretzels I had were Snaps, so I trimmed off the edges to make them more “antler” like. Regular pretzels work better. I dipped, then added the antlers and his nose. Once they were dry, I just used the black icing to draw on the eyes and smile. Also, what is going on with the candy melts? See the discoloration and the “striping” on them? The candy was melted and all the same color, so I don’t know why this happened. My guess would be that the candies were old and it’s a separation issue. I liked these little guys better. One more *personal* complaint – I did not like the Gingerbread and Cinnamon combination. These pops were way too sweet for my sweet tooth! These are the three kits that I found at my local Wal-Mart. All in the $8 range. Honestly, I could not bring myself to buy the snowmen – where are their noses?? – Discoloration of the candy melts – looked odd. Overall – This would be a fun project to use up some time over the holidays. Don’t expect to get all 20 cake pops done unless you pick up an extra bag of chocolate candy melts. If the shaped heads are too much to handle, just roll balls and make your own reindeer with pretzel antlers. The kids will enjoy those just as much. If you make these yourself, please let me know what you thought of the kit! I like yours way better. And there is no way I could do either of them, kit or not, lol. These are actually the cutest things ever!! What a sweet little Christmas treat 🙂 Love it!! I dunno, I think they're kinda cute. 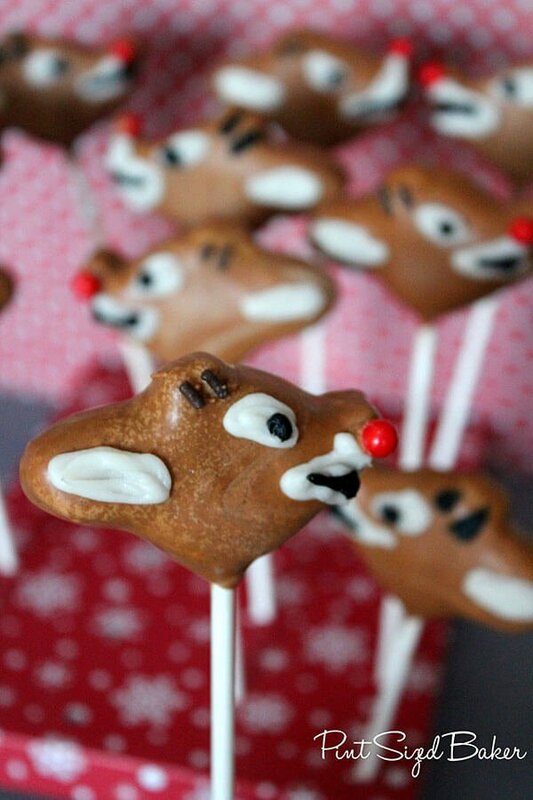 I would probably use melted white chocolate to do any of the white features on the Rudolph heads. It's just easier to work with, and you can do fine detailing using a toothpick. Thanks for telling us about this kit. These are too cute, I dont have the craftiness to do these, your cake pops always come out beautiful! I think they turned out pretty good! But thanks for the heads up about there not being enough melts. I will have to remember to get extra if we do end up purchasing that kit. Thanks so much for linking up to the Keep Calm and Link Up! Hope to see you back next week! I think your version is much cuter! Thanks for sharing this week at One Creative Weekend! Have a great weekend! What a great review! There is NO way a kid could make those pops. My son would end up in tears! The best think I have tried is the Ginger Bread Houses from Trader Joe's. The gingerbread is actually baked with tabs and slots so the KIDS can put the house together and it doesn't slide apart while the icing is drying. The white bands on the heads look like a chocolate bloom maybe? Anyways your look pretty good but you have skills ; ) Thanks for sharing on Super Sweet Saturday. I think yours looked pretty cute! Sorry you were not that happy with them. I think kids might have a good time with the kit though. They came out pretty cute but yours are def cuter! 😉 Thank you for the review! I am sure the kit would be handy for the less experienced cake pop maker and if they would come by and read your tips and dislikes about the kit before they make them it would help them so much! Reviews are so helpful! Visiting you from the Sunday Scoop! These are super cute! Thanks for sharing the experience with all of us! I am about to make a bunch of cake pops for my little guy's bday! You are a featured favorite this week on Saturday Show & Tell on Cheerios and Lattes! Thanks again for sharing; we love having you join us each week! See you soon! These are just precious! Hope you are having a great weekend and thank you so much for sharing with Full Plate Thursday.